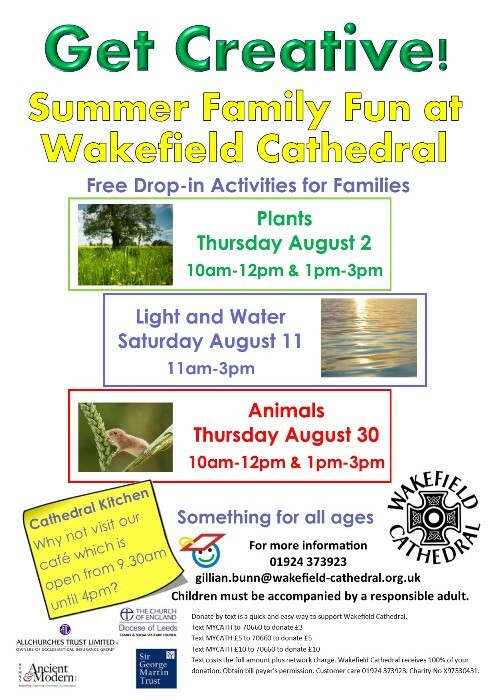 During August, the city of Wakefield has been transformed into Wakefield-by-the-sea with sand, donkey rides, buckets and spades, and Wakefield Cathedral is playing its part by offering a free craft drop-in for families. It is all part of the Cathedral’s summer family fun programme launched last week when families were invited on a treasure hunt to find different plants hidden in the Grade 1 listed building’s famous collection of Victorian stained glass windows as part of a day of free plant themed crafts. The Community Outreach officer, Gillian Bunn said: “Once you start looking round, it is amazing what you can find here in our cathedral; you can always discover something new. “We had a lovely time finding different plants and flowers hidden in our windows and have more exciting crafts planned for the rest of our summer family fun programme,’ she added.